you ignite in me the fire of ecstasy. and of my grief’s intensity. would shed such tears of pity. look, the proof is my body. Everyone found those verses “utterly delightful.” The caliph ordered the verses set to music. That was the only song sung for the rest of the day. A highly privileged slave girl, who herself owned slaves, passionately urged her owner to gaze upon her body. Such circumstances explode the minds of present-day men-hating academics. But wives, you might enjoy trying such poetry with your husbands. ‘Ali, I’ve never seen anything more beautiful than that streak of black against her white cheek. Go ahead and compose a poem for me about that! how lovely that streak where the musk left its mark! but she etched many more on my heart. Al-Mutawakkil’s given name was Ja’far. In sympathy with her owner’s love for another woman, Mahbubah wrote the first four lines in his voice. The next two lines are from an objective, third-person perspective. The last two lines sympathize with the other woman, Qabihah. Mahbubah addressed to Qabihah a prayer that she experience passionate intimacy with al-Mutawakkil. That’s astonishingly big-hearted generosity, as difficult to imagine today as the big-hearted generosity of Bacchis and Colophon. They arrived in all their splendor, adorned, perfumed, and dressed in brightly colored clothes bedecked with jewels, except for Muhbubah, who came dressed in plain mourning white and not wearing any makeup. when I cannot see Ja’far? murdered, rolled in the dust. and join him in the grave. For the bereaved, death is sweeter than life. The slave girl Mahbubah loved her former owner, the assassinated caliph al-Mutawakkil, with loyalty that transcended death. She was a strong, independent woman who sang a declaration of political rebellion. Infuriated, Wasif was about to order Mahbubah killed. But Wasif’s co-commander asked for her. He received her and freed her. She left the city and died in isolation and grief. For her amazing love, Mahbubah deserves to be remembered and celebrated. Toorawa (2015) p. 79. All the quotes and narrative details are from id. pp. 77-83. In the ancient Islamic world, poets competed aggressively with each other for acclaim. Slave girls’ poetic skill sometimes overwhelmed their attractiveness. For example, the poet Ibn Abi Tahir visited the slave girl Nabt. He noted, “She had a lovely face and voice.” But her skillful capping of poetic lines humiliated Ibn Abi Tahir. He got up and left. Id. p. 93. The most highly intelligent women know how to use their intelligence intelligently. [image] Young woman with a spray of lilies. Painting. 16th century Iran. Item F1932.64, Freer Gallery of Art, Washington, DC. Thanks to Freer|Sackler Open F|S. Toorawa, Shawkat M., ed. 2015. Ibn al-Sāʿī . 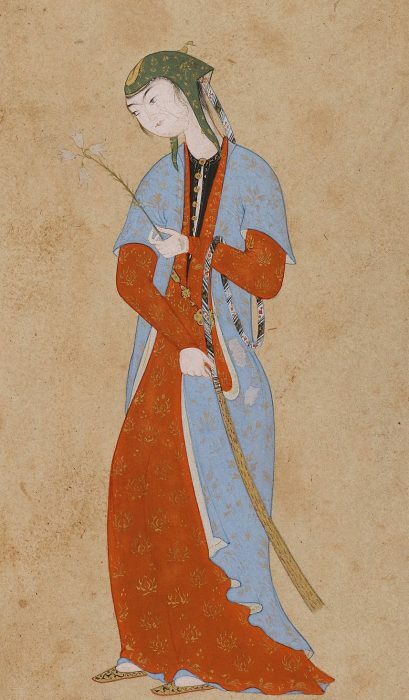 Consorts of the Caliphs: Women and the Court of Baghdad. New York, London: Library of Arabic Literature.